MTA won planning permission the Camberwell Conservation area to extend a typical split level Edwardian house. There was an existing solid brick rear addition containing a utility space and WC and blocking views and light into the kitchen. Our challenge was to open the kitchen into the garden, with a full width extension whilst retaining the views from the rear music room to the garden and create a contemporary family space from which to enjoy the garden with natural light. 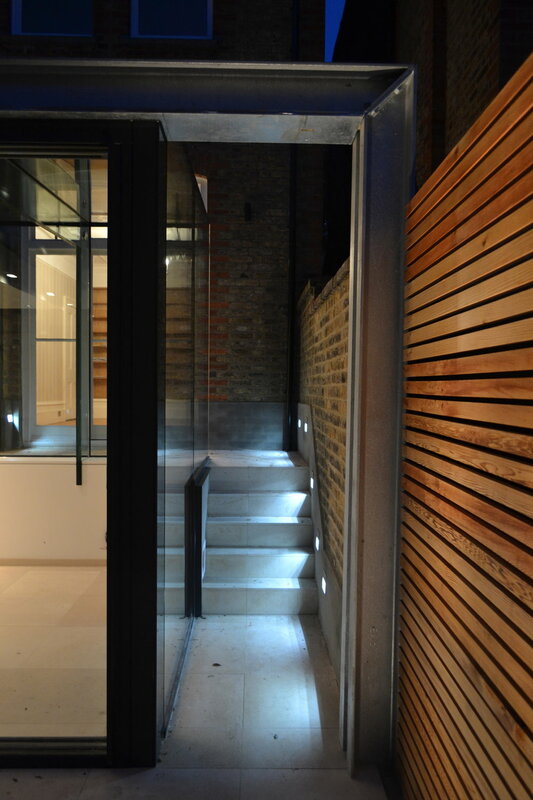 We developed an light flooded and transparent extension with slim line glazed doors to a rear extension which was part roofed in zinc and part roof in structural glass. By creating part of the extension in structural glass it allowed views to pass through from the refurbished music room and created a space in which the garden could be enjoyed in all weather and all seasons. Openable structural glass roof lights were positioned against the rear wall of the house int he solid zinc roof to ensure the space was filled with natural light and to allow natural ventilation. The same limestone tiling was continued from inside to out to extend the views and feeling of space into the garden. It was also used to tile the external steps leading to the rear music rooms, which are delicately lit to guide access and views into the garden. The new extension was elegantly framed in slim galvanised steel channels which unified the rear elevations and cleverly conceal the gutters and rainwater down pipes.